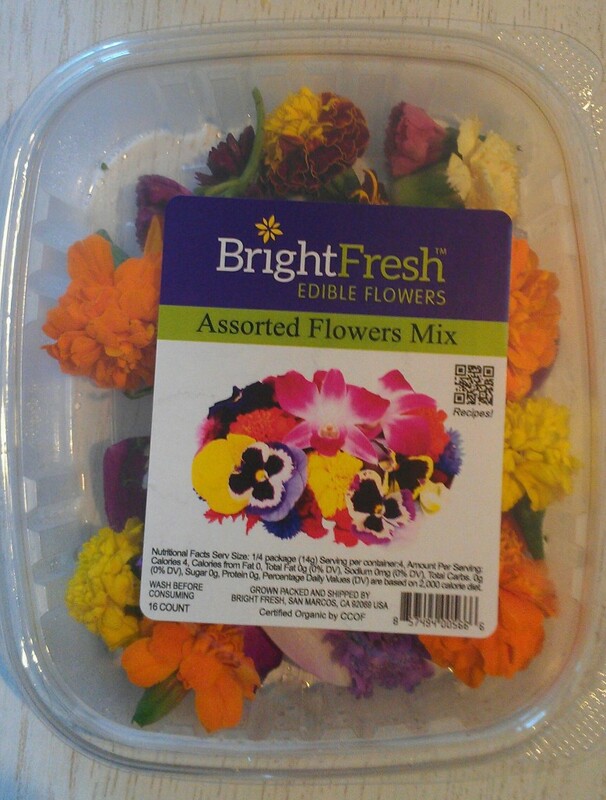 This 16-count assorted flower mix of Bright Fresh Edible Flowers retails for $3.99 – $5.99 depending on the retail store. Feasting on a salad, dessert, or entrée, made with edible flowers makes it all that much more special and decadent somehow, wouldn’t you agree? They definitely add a fresh fragrant vibe that’s hard to ignore. Plus, as I’ve discussed in a previous post, studies have shown that flowers may possess some very potent health benefits due to their phenolic content and high antioxidant levels. They have anti-tumor, anti-inflammatory, and anti-aging properties. In other words, they are a great way to enhance not only your food, but your health as well! So, when I was at the Natural Products Expo West trade show and a company official from Fresh Origins offered me a package of Bright Fresh Edible Flowers to try, of course I said “Yes!” without any hesitation. How could I have resisted? They were a feast for the eyes and the palate. Plus, when I found out they were organically grown, I was fully on board. No pesticides or herbicides to worry about. I could use them freely in my cooking whenever and however I wanted. When I inquired about their availability in stores, I was excited to learn that they are getting picked up by several retail chains. Awesome, right? Fresh edible flowers whenever you want to add some extra pizzazz and freshness to your culinary creations. No need to grow your own organic flowers to eat, which I realize only a very small percentage of the population probably does. And yes, that includes me! So be on the lookout for them in a store near you or check out the Fresh Origins website to see which stores are currently carrying them. These assorted edible pansies are sold by Fresh Origins, too, and available to chefs and bakers. As I’m no gourmet cook, the first thing that popped into my mind was how I could use them. I had used single flowers in my cooking before (e.g., nasturtium flowers in a salad, rose petals on a cake, lavender in lemonade) and even written a post with links to some awesome flower recipes, but never had I used an assortment nor some of these particular flowers. And because they were perishable (a container lasts about 5-7 days in the fridge and I was going on day 5), there was no waiting until a creative moment struck. Stir fry? Maybe, but no. I didn’t want to mask the flower flavor too much. Dessert? Could work really well, but I wanted them in a meal. Entrée salad? Yes! It would be the perfect way to honor the fresh, delicate taste of the flowers, which is exactly what I was after. Now, it had been a long day and I was not in the mood to run to the store to purchase additional ingredients for a special recipe — and I must admit I was even a little lazy about doing anything fancy — so I decided to use what I had on hand. I eyed some leftover poached salmon in the fridge and figured that would be the perfect protein, because it wouldn’t overpower the flowers. Blueberries were calling my name, so I grabbed those. Next, I considered walnuts for crunch, but realized I was out. Drag. Then — this was the really fun part — I got to select the flowers! I settled on the daisies, marigolds, and roses and saved the lavender and orchids for something else. 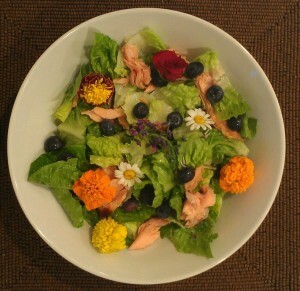 Blueberry salmon salad with tasty edible flowers and a berry vinaigrette. When it came to choosing the dressing, I knew I had to select carefully. A light, sweet dressing to enhance the flowers and the berries seemed fitting. Something too herby or zesty would have been too much. A light champagne vinegar came to mind, but I didn’t have any on hand, so I chose a berry vinegar and a blood orange olive oil instead. After crossing my fingers and tossing the salad, I took my first bite. You know what? It was awesome! I honestly didn’t know what to expect. I really liked the flowers, especially the small roses and daisies. They were just the right amount of floral with the salad greens and salmon. But I wasn’t quite sure how to eat some of the bigger flowers because of the stems. So I plucked them out of the salad and ate them sort of like shrimp — I held the stem as if it were the tail and ate the flower. Yum! All the flowers lent such a nice, subtle taste to the salad and on an energetic level, I felt good eating them. I was truly lifted by eating this simple salad with flowers. It seemed spring had arrived — and it was in my salad bowl! Now, my husband, well, he wasn’t so enthused about the salad. When I asked why, he said it was too floral and felt like he was eating flowers. Umm. Wasn’t that the point?! I was a little surprised at his lack of — and inability to connect with my — innate “hunter-gatherer” enthusiasm for these vibrant floral beauties I found and added to our meal. After some contemplation (and I might add a little disappointment that my “gourmet feat” wasn’t well received), I realized maybe I should have broken up the larger flowers and just used the petals. That way the floral taste would have been a little more evenly distributed and not so overpowering. I guess it would have taken care of the “stem” problem as well. Another thought I had (had I been eating cheese at the time), was that I could have pressed some of the petals into bite-sized goat cheese balls. That would have looked beautiful and probably tasted really good, too. What do you think? By the way, after making my salads, even with using several whole flowers, I definitely had a lot leftover. So, I think one package could easily be used for a few good recipes. Had I the chance to plan ahead a little more, I definitely would have used them in other ways, such as adorning a cheese platter or maybe even decorating a cake. 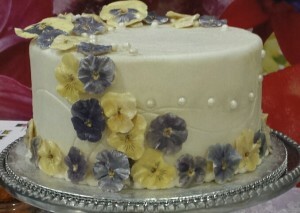 Wouldn’t a cake adorned with edible pansies like this one be fantastic for a special occasion? Should you try these edible flowers? I think so. Give them a go! And don’t be too hard on yourself if your first attempt isn’t 100% perfect! I can guarantee you they will brighten your meal and turn it into a special culinary treat! Disclosure: A package of BrightFresh Edible Flowers was provided by the manufacturer. Copyright © Karen Peltier and Well Gal, 2015. All rights reserved. Photos © Karen Peltier and Well Gal, 2015. All rights reserved. Honestly, it’s my first time seeing some real edible flowers in a packaged. I still find it funny or somewhat weird thinking of eating a flower. But, maybe, in the future, I might find myself eating edible flowers, if its available in some nearby grocery store. I guess, it’s a good gift for my vegan friends. This will totally be a great birthday gift too. Thanks for giving me an idea. I have never eat edible flowers, specially marigold flowers never . Nice to meet you. Thanks for sharing your perspective on eatings flowers and how in India marigolds are used for worshipping. I had no idea that was the case, so I can definitely see why no one may eat them there. Makes total sense! By the way, at Indian restaurants here in the U.S., I’ve had a rice pudding with rose water for desert. Is that something done there as well? If so, that’s one form of “eating” flowers in a way. Yes , here people include rose water in the food, specially in dessert . But I have never tried that. Good to hear that you had Indian food. How’s you experience with it ? Well, I absolutely love Indian food! It’s so full of flavor and I like how many dishes incorporate lots of spices and/or herbs. Plus, the variety of vegetarian dishes is very nice. I’ve only ever eaten it in restaurants, though. One of these days I’d like to learn how to cook some Indian dishes at home. Thanks for this great post. This is very informative. I never considered the health benefits of flowers but it makes sense. Let me know if you get a chance to try any flowers in your cooking and how you like them. We’ve eaten dandelion blossoms, clover, rose petals and lilacs. I’m game for trying different ones. I don’t think there’s anywhere around here we can buy them packaged, but it’s easy enough to google for edible flowers and wildflowers. Lilacs were one of my favorite flowers growing up. Not in terms of eating them, but just smelling them and adoring how beautiful they were. How have you eaten them? I’ve never tried one but I imagine it would be fabulous! Also, I agree that the cake looks delicious. Now I’m imagining it adorned with lilacs. Wouldn’t that make a beautiful statement? I have been eating edible flowers for years! My favorite is marigolds because they are pungent. But I love to garnish a salad with them. The first time I brought them out to the Family, they looked at me like I was crazy. But as I was eating them, they too gave it a try and loved it. There are so many things you can do with them! The first time I ate a marigold was when I tried the package of edible flowers. Until then, I didn’t even realize they were edible! But I’m so glad to hear you’ve been eating edible flowers for years. Maybe you’ve got some great recipes to share? I’m still not use to the idea of edible flowers. I think about a year or two ago, I started reading up on it. I may have to try some out of curiosity. They’re definitely a treat! I hope you get a chance to try them. Once you do, you’ll probably wonder why you hadn’t tried them sooner. Hello Karen, I have never tried edible flowers before and love your idea with these tastey looking things..
Chery Schmidt recently posted…How Far Would YOU Go For Online Success?